Sorry you haven’t heard from me in a while. I am still working on my winemaking degree and have been going through the beginning steps to open a winery. 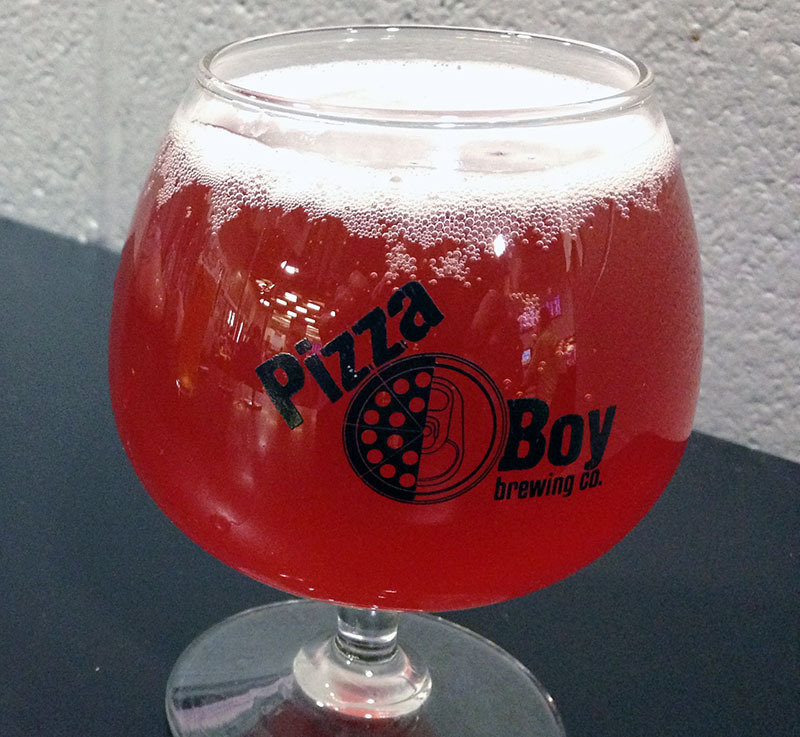 I know… How can a sour beer guy can become a pro wine maker? Well there are actually a lot of similarities between tasting wine and tasting sour beer, but when it comes to winemaking, the most important lessons learned from sour beer are usually “what not to do”. I’ll save all that for another article. 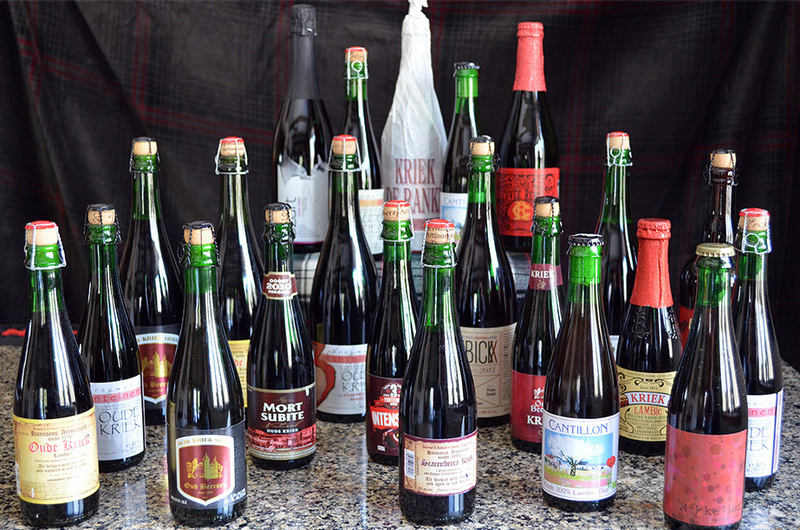 This article is about how I hosted a “brown bag” sour beer blind-tasting at my house for both the authors at Sour Beer Blog and some of our close friends. My original idea was to host a beer dinner and pairing, similar to our Epic Kriek Night, but I decided that it would be fun to hold a blind tasting instead. In one of my sensory courses for winemaking, we held a camp where we did blind tastings. In this camp we didn’t know what styles we were tasting, only if the wine was a red or a white. The 20 participants blindly tried samples from one bottle simultaneously, then gave descriptors and ratings on what we were tasting. Some were local Pennsylvania wines, some were homemade, and some were well-known national brands. I thought that this would not only be a fun process to incorporate into a tasting night, but also a great way to learn about different breweries and styles without having any pre-conceived notions. We tasted 15 beers that were broken up into three flights of five samples. When setting up the flights, my first goal was to try and get broad variations of each category, and try not to repeat distinct styles. I also wanted to have each beer made by a different brewery and even breweries used in collaborations were not repeated. I stuck with mostly US beers, but there were a couple of imports, and all bottles were either 22 oz or 750 ml in volume. Each participant had a tasting sheet where I asked for one or two word descriptors for each of the following categories: Appearance, Aroma, Flavor, Mouthfeel, and Overall Impression. I also asked for a numerical score for each of the 4 flavor intensity categories that we use on this site: Sourness, Brettanomyces character, Acetic Acid presence, and Sweet to Dry balance. I will list the beers that stood out during our tasting along with brief sensory descriptors, as well as their average flavor intensity numbers. We referred to the 2015 BJCP guidelines when thinking about style groupings. The first flight wasn’t arranged in any particular order, the second flight was served lightest (SRM) to darkest, and the third flight was a grouping of fruited sours or fruited farmhouse ales. I haven’t included every beer in the tasting notes below, there were a few that we didn’t enjoy, and won’t mention. Poured clear, golden straw color, with a white head. Aromas of tropical and citrus fruit, with slight Bretty sour dough. Flavor was pilsner malt, cracker, citrus peel, with slight saison metallic and spice. Very dry with light body, and very carbonated. An excellent farmhouse saison with clean, bright pilsner, and citrus flavors with solid Brett characteristics. Deep gold to almost light copper, with slight haze and very little head. Aromas of sweet malt and fruity Belgian esters. With slight vinous and animal tones. Flavor is softer pilsner malt, with oranges, vinegar, and wine. Lightly carbed, with medium body, with late astringency. Very Belgian inspired, with hints of wine oak. Beautiful crystal golden yellow color. Spicy, peppery, and phenolic aromas, with slight fruit, grass, and a little metallic. Flavor a lot like aroma, with spicy peppercorns, grass, and straw. It was crisp, very dry with light to medium body. This beer tasted like a classic saison, very crisp and spicy, with little farmhouse funk. Hazy golden yellow. Subtle aromas of flowers and peaches, with slight Brett and lactic acid. The noticeable flavor was briny, salty, and mineral, with sour dough. Then finished off with light fruit, malt, sweat, and wet dog. Low medium carb with medium body and slick mouthfeel. An array of characteristics you can find in Belgian Lambics, without actually coming together to have a gueuze-like profile. Copper, hazy, with large head. Aroma was dried citrus hops, with slight malt, and yeast phenols. Classic Saison flavors of spice, metallic, and dried flowers. Medium body, with medium-plus carbonation. This beer was past its prime. It had solid Saison characteristics, but had slight malt and hop oxidation. Light yellow to hazy gold. Aromas were subtle with sweet malt, lactic acid, dry earthy, and a little sweaty. The flavor was less subtle. Crisp, sweet malt, and sharp hay. Finished with tropical fruit, orange peel, cider, and a touch of vinegar. Highly carbonated, dry, with a light to medium body. A tough beer to classify as we tasted it, saison like, but a little sour. Fairly clear gold, with dissipating white head. 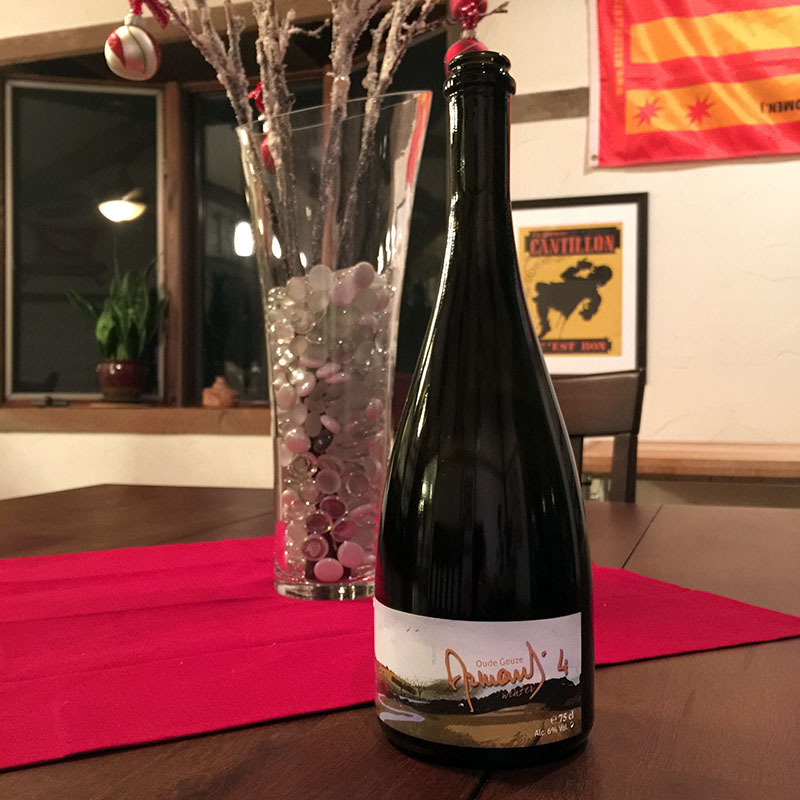 Strong Brett aromas: horsey, animal, hay, decaying leaves, with floral hints, and slight Lacto, cooked corn, and oak. Pilsner malt flavor dominated, with slight DMS, cooked corn and wheat malt. The sourness was from lactic acid and a little acetic. It had one of those sour profiles that, while hard to pin-point, had a distinct combo of flavors that we associated with Pediococcus. It was very carbonated with little body, carbonation sharpness, but balanced tart with malt flavor. Solid beer, but not what I consider a Berliner, that’s why I put blonde in the title. Deep amber to light brown, very clear. Initial aromas of caramel malt, biscuit, and oak. As it warmed, more lactic, and vinous, and slight cardboard. Flavor was similar to aroma, but more acidic, with candy sugar, wine oak, and hint of chocolate. Medium body with balanced malt sweetness and acidity, low medium carbonation, and finishes with alcohol warmth. Very balanced beer. Could do with either a little more carbonation, or a touch more acidity to bring sweetness down a little. Great representation of a Bruin made in the USA. Light hazy orange, with rose hue. Pleasant berry and jam aroma, with slight malt vinegar and ethyl acetate. Flavor was also very subtle and mostly pilsner malt. It also had flavors of grapefruit and vinegar but not offensive. Mouthfeel of the beer was medium across the board, medium body, medium dry, medium carbonation. Also had slight burn from vinegar. I didn’t mark when this beer was made, but may be past its prime. Still a very drinkable beer, and an awesome label. Light hazy straw to gold. Aroma was wonderful citrus fruit rind, tropical, and grassy dry hops. Saison-like in flavor, with dry hops, grapefruit, and earthy Brett. Light to medium body and carbonation, with slight bitter and tannic aftertaste. Very nice beer, had the qualities of a nice dry saison, but added complexity of a west coast IPA with the nice big dry hop and grapefruit. Select beer or ask everyone to bring a beer. Either way as host you will know what all the beers are, unless you have a non-participant set it up for you. Even though the host may have some biases on their own feedback sheets, they can still enjoy the tasting. It’s completely up to you whether to buy them all, or to save money and ask everyone to bring a bottle. If you have a group of friends who enjoy these tastings, take turns hosting! Keep the beer count between 8 to 12 beers. I think my 15 beer count was a little overboard. When you have a large collection and want to try all of them, it’s easy to add too many. This number also depends on how many guests you have, so it is not a set-in-stone rule. The difference between most beer and wine tastings is that beer drinkers choose to drink the beer and not spit it out. Spitting out wine helps to keep you sober and professional, but I don’t like to spit out good beer. The act of swallowing at least some of the sample helps to form a complete sense of the taste in your mind. Make sure your tasting space is well lit and comfortable. You do not want a lot of background noise or distractions. I like to set up as far as possible from the bathrooms or high traffic areas. Have some snacks. But don’t have foods with flavors or aromas that are overbearing or palate wrecking. Crackers, pretzels, and some light cheeses work great. After the tasting is done you can have an actual meal. Make sure everyone has water. Make sure you have a lot of glassware. It is nice to be able to rotate glasses and not have to rinse every few minutes. While we poured and tasted each beer one at a time, I would like to try multiples side by side next time. My only worry is that beer will slowly lose carbonation after being poured so by the time you get later into a flight, the beers could become flabby. Wrap the bottles in a velvet bag, a brown paper bag, or aluminum foil. After wrapping them, number the bags. In our wine camp the instructor chose random numbers for each bag. This was because having a numerical order may subconsciously introduce a bias that the beers become better or worse in some order. There are many ways to hide the identity of the beers. Pick whatever is convenient. 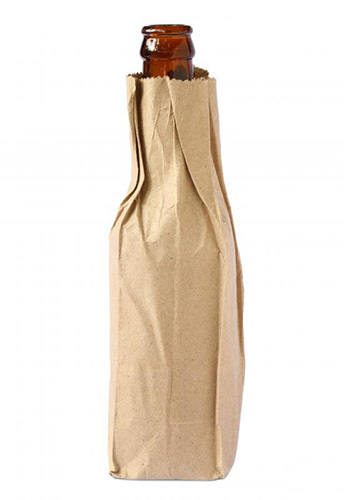 If you plan ahead you can order nice wine bags. Regardless of what you do, just make sure you cant see the label, and watch out for bottles that have distinctive shapes or openings that may give away their identity. Pass the bottles around the table. Makes sure not to pour too much and leave the last person with only a yeasty pour. I have not yet decided if its better to have someone pour the samples for everyone. If it is a small group this can be fine, but in a larger group it makes a lot of work for someone. Try not to discuss the beer being tasted until everyone has had a chance to record their thoughts. Conversation can sway people’s notions and make them lose concentration. Wait a few minutes, then openly discuss your thoughts. Let everyone have a say. Be responsible and have fun! Remember, no matter how you rate, rank, categorize, admire, or argue about the beers… Have Fun! Don’t be offended by someone’s thoughts, and don’t put down anyone else’s opinions. When we do wine camps, we feel that there is no real wrong answer, and I like to bring this attitude to my tastings. Each person relates descriptive words for flavors to memories and concepts a little differently. Two people can taste the same thing, but describe it very differently, it doesn’t mean that one of the two is wrong. When the tasting is over, always remember to be responsible. There are plenty of options to avoid driving drunk, use them. A classy host may even grab a pocket breathalyzer in case their guests are unsure of their intake. I hope this article will inspire some of you to try a blind tasting. I also hope that those who do will find some of these suggestions helpful when it comes to planning. Remember that these are just suggestions, so get creative! We would love for you to share your ideas and experiences with us in the comments below. And if you do decide to host a sour beer tasting, feel free to invite us! 4 Year home brewer. Certified former bartender. Provisional BJCP beer judge, waiting to get my exam score back. Working on the Cicerone program.